French fries are just the best, aren’t they? Especially when they’re served at room temperature…wait, no, I’ve got that wrong. It’s baked potatoes that taste best when they’re served without even a trace of warmth, right? Of course not. As a matter of fact, I’m pretty sure that preferring either of those foods lukewarm is one of the tests they use to catch robots that are masquerading as human beings. So why, then, are we supposed to eat potato chips that aren’t warm? 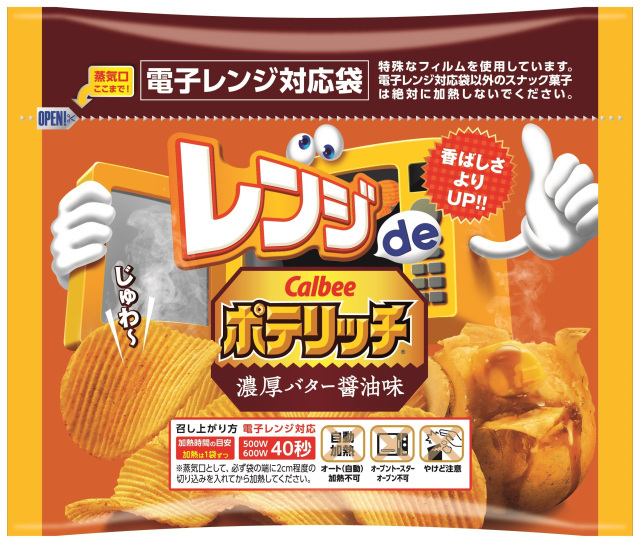 Japanese snack maker Calbee asked itself that question, and was apparently unable to find a good answer. Instead, it’s come up with an awesome solution: potato chips sold in special bags that you pop into the microwave and heat up before eating. Calbee’s new Renji de (“In the Microwave”) series went on sale Feb 19, with the first offering being Renji de Poterich Rich Butter Soy Sauce Flavor, made with butter from Japan’s northern dairy island of Hokkaido. 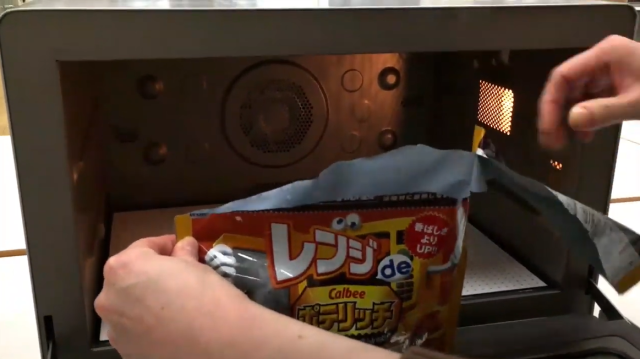 While you could just tear open the bag and start eating the chips, like a Philistine, the wiser choice is to make a small (two-centimeter) tear at the top of the bag, then place it in the microwave for 40 seconds. ...and you’ll be greeted by an intense, buttery aroma wafting up from your toasty warm potato chips. Not digging the fusion flavor of soy sauce for potato chips? 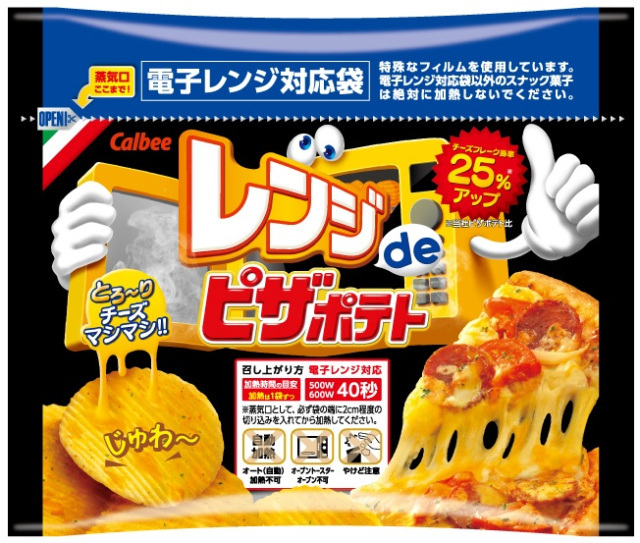 In just a few weeks, Calbee will be expanding the lineup with a second microwavable chip flavor, the Renji de Pizza Potato, which packs 25 percent more cheese than the company’s preexisting pizza-flavored chips. The Butter Soy Sauce chips are priced at 152 yen, while the Pizza Potato is just slightly more at 173 yen. Both types of microwavable chips are exclusive to FamilyMart convenience stores, and since Japanese convenience stores always have a microwave available for customers to use, you can heat your chips up right there and enjoy a warm snack on the go. -- Japanese snack food maker introduces new potato chips…for women! -- Get ready for a cherry-blossom-flavored spring with Sakura Butter potato chips from Calbee! I am pretty sure microwaving food with plastic containers is unhealthy. I avoid the microwave whenever possible. Love the introduction of this article! I thought they're collecting these from the shelf as it caused smoking incidents. Maybe it's better to publish negative news. Don't need those. Anyway, who would eat potato chips when you can eat corn chips? Ah, crisps. Got confused with the US nomenclature in the header. Not sure about warming them, but you sure can't beat a crisp butty. 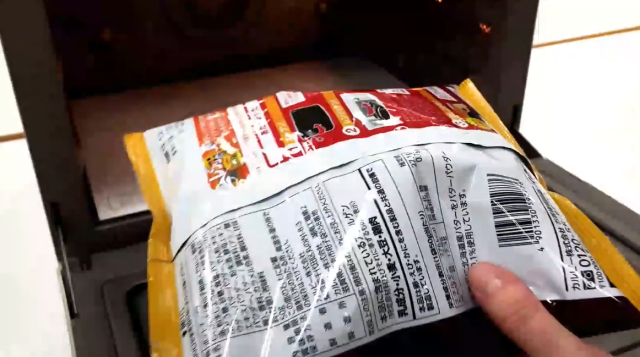 On Feb. 22, Calbee announced a recall of this product. Wow! Irradiating one's food! What a concept.